There are quite a few jobs like changing your oil, working on your exhaust and other routine maintenance tasks that can be done at home. However, completing these tasks requires the car be lifted by a few inches from the ground. A car jack might get the job done, but it is a little more complicated to use and not as safe as using a set of car ramps + they are cheaper! Reasons like convenience, safety, and affordability make car ramps an ideal product for your home garage. Yes, a 2 post car lift would be ideal, but most home mechanics do not have this luxury. So with those points in mind, we honestly believe that it is worth investing in a pair of quality car ramps for your home garage. Depending on your requirements, there are a number of options available on the market today which will keep you safe no matter how heavy your car, truck or SUV is. To help you make an informed purchase decision we have reviewed some of the car ramps highly rated by professional mechanics. Why use a car ramp to change oil? Q: Car Ramps Vs Jack stands which are better? Q: What should be the ideal length of my car ramp? Q: What should be the ideal incline for the ramp? Q: What should be the weight capacity of the ramp? Q: What are the safety tips to be followed while using a car ramp? Q: How long do car ramps last? Q: Who makes the best car ramps? Click the ‘More Details’ buttons above for detailed specifications for each product, or read on for our reviews of the top 6 race ramps available on the market today for changing oil. 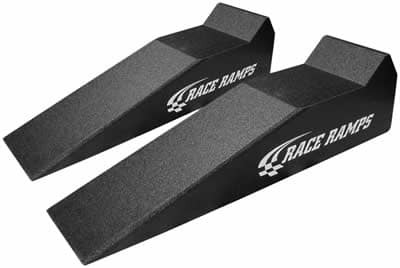 The Race Ramps RR-40 is the best choice for maintaining and displaying your sports or racing cars. The USP of the 40-inch race ramps is their light weight and no fuss design. Although being lightweight, it is one of the sturdiest ramps available that can accommodate tires up to 8 inches in width easily. It is designed to raise your car comfortably up to 7 inches providing ample room beneath. These come in a sturdy and solid design and do not slip irrespective of the surface. The durable composite material of the core ensures that it can withstand the toughest of treatments. The design comes with a 16.7-degree angle approach that makes it ideal for lowered and short-nose vehicles like Triumph MGs, Jaguars, C1-C3 Corvettes, BMWs and other such models. But it should also be noted that the ramp doesn’t work with C5s, C6s, and Vipers. More DetailsThere are other 56 and 67 inch ramps available from the same brand that can be a suitable choice. 40”L x 10”W x 10.75”H (7” of lift) and has a weight of 8.49 lbs. Maximum weight capacity is 1500 pounds per ramp or 6000 pounds per set. Designed in high-density expanded polystyrene and coated with a hybrid polyurea to impart strength and lasting durability. Premium quality material also ensures it is rust free, anti-skid and does not transfer heat or cold. Also, it provides optimum protection to the floor from all kinds of damages. Comes with a carrying strap for easy transport and storage. I used it to change the oil on my Tundra and Xterra with no issues at all. It was quick, easy and I felt safe the whole time. Overall we can say that it is one of the best available options in the market that comes with an amazing set of features in comparison to the rest. Another product in our list of affordable car ramps is the Nicky Nice Solid Steel Auto Ramp made from solid steel. This is the go-to product if you are looking for something that is lightweight and versatile. It consists of a 35-inch long set of ramps with the design featuring a durable powder finish. This ensures that the ramps are protected from extreme weather conditions like snow and rain. More DetailsThe design and construction of the ramp allow it to support a 6500-pound gross vehicle weight. This implies that each ramp can approximately withstand 2000 pounds. The heavy-duty steel design and structure makes the ramp highly durable and long lasting. The ramps can deal with a collective gross weight of 6500 lbs. Powder coating and solid steel material give it a long-lasting finish. Includes safety rails for enhanced security. Can accommodate tires up to 9 inches in width. The dimensions of the product are 30 x 12 x 11 inches and are 35 inches long. The product has a 4-star customer rating on Amazon with a majority of the users being happy with their purchase. Overall the product has been praised in terms of quality and was found suitable for maintenance jobs like oil changes. Most of them felt that the only minus point the product had was that they were prone to slipping and had a steep incline. Overall it is a good option if you are looking for a low-cost version or do not want to spend a fortune. The RhinoGear 11909ABMI with its rugged construction and ability to withstand heavy weights is one of the best car ramps for changing the oil. Affordability of the product is its primary USP as it costs less than a third in comparison to others. It is an ideal choice if you are looking to save money. Designed with a 17-degree incline, it provides easy access and a good view of the underside of the vehicle. Manufactured in low-weight composite material and a high traction design the ramps are non-skid and prevent slippage. More DetailsThe ramps can withstand a weight of 12000 pounds and are excellent for SUVs, pickups, vans, trucks, and small cars. The solid resin material makes the ramps highly durable. Despite having a sturdy design, they are very much portable. Nest-able space saving design for easy storage and carrying. Available in a set of 2 with product dimensions 38 x 14 x 12 inches. Designed with a 17- degree incline the product weighs approximately 19.1 pounds. Can be efficiently used with vehicles having a tire width of 9 inches. Rugged structural design along with a non-skid base. One of the best available budget options averaging 4.5-star customer rating on Amazon. Consumers have been satisfied with the quality and functionality of the product. As the name suggests, the Trailer-Aid Tandem Car Ramp is perfect for changing tires for trailers. Since it is used for heavy-duty vehicles, the total weight capacity of the ramp is 15,000 lbs. The dimensions of the product are 24.7 x 7.5 x 6.3 inches, and it approximately weighs 5.89 pounds. These affordable and sturdy ramps come with a unique set of features and design. These are quite lightweight yet can withstand a gross weight up to 12,000lbs. Its design has a core parabolic arch that runs in the middle of the ramp providing equal weight distribution and support. The product is ideal for medium sized sedans. More DetailsIt is manufactured using lightweight plastic material that makes it highly portable and resistant to extreme weather conditions like snow and rain. Also, the design features a grid system that ensures better traction for safety and stability. Looking to buy a set of ramps for your heavy vehicles like cars, trucks, SUVs, and vans? 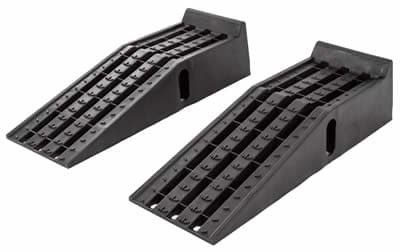 The Black Widow PSR295 Black Plastic Service Ramps is your go-to product. Providing a maximum lift of 7 inches it allows you to easily get underneath the vehicle to do the service and maintenance jobs. Made from high impact plastic the product features a grid design for better traction and stability. More DetailsThe design and construction also allow dirt, snow, and water to flow through easily. Another important aspect of the design is the internal support system running through the center of the ramp giving an equal distribution of weight. Gross weight capacity of 16,000 lbs. The ramp can handle vehicles up to 8 tons with ease and not break under pressure. The product also includes a grid pattern on the surface designed in compliance with the 3 channel tire tread pattern found in a majority of the modern vehicles. Overall the product is quite sturdy and stable and enjoys a 4-star user rating on Amazon. Apart from car ramps, there are other products available that might help you change your oil or perform other routine jobs. Wheel chocks also known as wedges are made from a sturdy and strong material which when placed against the car wheel can prevent their accidental movement. 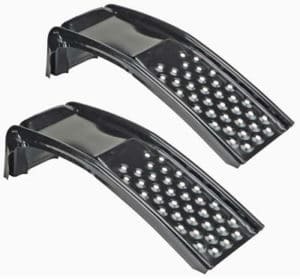 They are an absolute essential when you need to go underneath the vehicle for oil changing or any other maintenance job. They are made from a premium quality material that provides optimum grip with the ground. An oil drain pan is often one of the most overlooked accessories in your garage equipment. But if you wish to drain the oil out of the car the product makes the job easier. Hence it is essential that you have one in your car. The product is designed to make oil disposal easier without creating much fuss in the garage. There are pans available with lids as well that prevent spilling. 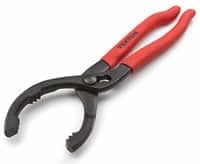 Oil filter pliers are a type of wrench that comes in handy if you wish to unscrew the filter. This particular type of tool can be used for removing spin on type oil filters and is especially helpful when the oil filter might be too tight to be unscrewed by hand. While you decide which is the best set of car ramps for you, there are a few things which you really should consider. Do you need car ramps? Simplicity and ease of use make a car ramp a preferred choice for oil change jobs. All you need to do is just drive up the slope and fix the wheel chocks on the rear wheels and you are good to go. While a jack stand requires much more manual labor. Safety is one important factor that weighs car ramps on the higher side in comparison to a normal jack stand. They offer a wider surface area for support and high stability. Lastly, car ramps are also known to be more affordable than a jack stand. Following the simple below mentioned steps, you can efficiently do the oil change for your car all by yourself. Choose car ramps as per the load of your car. Manoeuvre the car to the designated area and place the ramps in front of the wheels. Drive the vehicle up carefully and lock the rear wheels with chocks. Now place the oil recovery pan underneath the engine. Perform the necessary oil change process. Before getting underneath to do the jobs ensure that the car is safely secured with the ramp and the wheel chocks! If you intend to use a car ramp remember that you actually trust your life on it. If it fails to withstand the weight of your car it might accidentally crush you from the beneath. Before buying the ramp ensure that you make a thorough research before jumping on to buy the cheapest one available. If you wish to do the oil changing job all by yourself, car ramps become an essential requirement. But it is important to understand that you have the right kind of product that suits your car to carry out the job efficiently. There are certainly important considerations which when kept in mind can be helpful in making the right choice. It is essential to ensure that the ramp can effectively withstand the weight of your car. Weight capacity becomes an important consideration as your life relies on it. Never use ramps with lesser weight capacity as it may lead to accidents and put your life at risk. This plays an important role in choosing a good car ramp. In case the car has a lower ground clearance, it is always advisable to choose a ramp with an incline that is gradual and long. This will prevent the car from being damaged from underneath. Different vehicles come with different tire widths. Before making a purchase check if the width of the wheel is appropriate with that of the ramp. This is because sports cars, for example, come with wider wheels and may require a different kind of ramp. Also always consider buying a ramp that has a considerable margin. This would allow the driver to drive easily on the ramp without the risk of falling. Ensure that you purchase the ramp that provides good traction from the safety point of view when you load or offload the car. The American made ramps are considered to be safe and reliable in terms of quality. They undergo stringent quality checks before being launched in the market. Lastly it goes without saying, the price also plays an important factor. Always figure out the budget prior to making the purchase. Using car ramps becomes an easy process when used the right way. Also, they can be a much more reliable option in comparison to jack stands. The right method of using car ramps has been detailed below. Park your vehicle on a flat and stable surface and also make certain that the front wheels are aligned straight. Now place the ramps in front of the wheel with the lowering slope facing the wheel. This will help the car to easily slide on the ramp. Drive the car gradually on to the ramp and stop when the wheels have reached the bump. The appropriate angle of the ramp is necessary for the vehicle to stay supported on it. If your ramp is sliding away it implies that the speed of the car is not sufficient. Try increasing the speed a little. Once you feel you have reached the bump apply brakes instantly and stop the vehicle. The last step is to put wheel chocks near the rear tyres as this will prevent any accidental movement of the car. Once you are done remember to take off the wheel chocks before offloading the car from the ramp. Car ramps are equipment designed to elevate your car from the ground to a considerable height. If you are someone who likes to do the car maintenance all by yourself then the ramps are a must in your garage. Simplicity and ease of use are the major USP of the product. They are relatively easier to set up and drive up the slope. Also, they are known to provide higher stability in comparison to the jack stands. Due to the higher surface area available on the ramp the margin or error is also very low while loading the vehicle on the ramp. When deciding between jack stands and ramps, the budget also plays an important role. The former is more affordable in comparison. Jack stands can also do the job for you, but they are seldom used as the assembly is complicated. If you do not know the vehicle lift points using jacks might not be an ideal choice. While using the jack stand it is important that you use it with absolute precision. Else the vehicle can come crashing down if the jack gets displaced accidentally. In comparison, it is much easier to drive the vehicle on to the ramp. Also for cars with lower ground clearance placing the jack underneath might be a tough job. Also, you can place the car safely without the danger of scraping the undersides. The tool is not at all advisable to be used if you are a beginner as it requires a lot of skill and expertise. The length of the car ramp is determined by the vertical height of the car and also the size of the garage that you have. Also, the ground clearance of the car plays a major role in determining the length of the car ramp. Cars that have lower ground clearance should use ramps that have a smaller angle of approach and longer length. There are also other factors that might be helpful in determining the ideal length of the car ramp. One such factor is the size of the garage. Ensure that you have sufficient place to use the ramp inside the garage and the car does not extend beyond the garage door. The incline of the ramp is subjected to the type of the vehicle that is being loaded. For example, a sports car will have a low ground clearance hence will require a ramp that has a much gentler gradient. Ideally, the weight capacity depends upon the gross weight of the vehicle. But if you have a margin of 150-200 kgs to accommodate the fuel weight it would be beneficial. A car ramp might give you the complete access to the area underneath the car, but it is important to exercise caution while using them. This helps the user to safeguard themselves from all kinds of accidents. The primary requirement is to ensure that you drive the car slowly ensuring that the tires are well placed on the ramp. Next, never forget to use wheel chocks to lock the rear wheel. This will prevent the car from sliding backwards. Also, it is important to ensure that the ramps are used on a flat surface and not on some inclined terrains. This is because placing them on even surfaces helps you achieve better traction than otherwise. Also, ensure that you have a solid ground and not some icy snow filled base. Lastly, ensure that you engage the parking brakes while the car is placed on the ramp for added safety. The durability of car ramps depends upon a host of factors. Primarily how well you maintain the upkeep of the ramps can determine their lifetime. Other than this the material of the ramp also plays an important role. Ramps made from high impact plastic or metal have exceptional longevity, while those made from wood might not be very reliable in terms of durability. As per our list, both Rhino Gear and Race Ramps brand is considered to be one of the best brands available. As per customer reviews and user ratings both the brands are known to enjoy a good customer base. The product reviews on various online platforms have testified there ramps to be sturdy, strong and reliable. 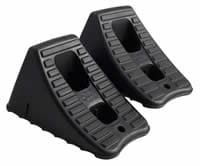 The innovative design and functionality of the Rhino gear ramps makes them the perfect choice for pickups, cars, trucks, vans and also sports utility vehicles. USP of the brand is the material they use in making the ramps. The Rhino Ramps are made from premium quality heavy duty resin material that gives them lasting durability. Race Ramps are also an equally favorable choice when it comes to car ramps. But it may be noted that the particular brand comes with price tags that are a bit on the higher side. In our review, we have discussed quite a few choices and options, but the best car ramps on the list are the Race Ramps RR-40 and the Rhino ramps. The former is perfect for race cars while the latter is suitable the regular trucks, SUV’s and cars. 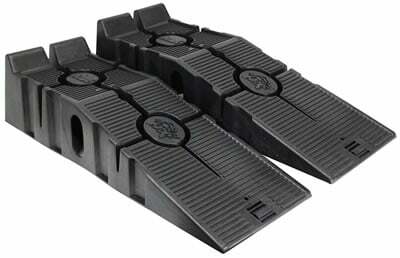 The Race RR-40 Ramps are no-fuss products with a robust design that can effectively handle tires as wide as 8 inches. One of the major draws of the product is that it is lightweight yet comes with a total weight capacity of 6000 lbs. The Rhino Ramps are an excellent choice for SUVs, pickups, vans and other heavy-duty vehicles along with cars. The non-skid CoreTRAC and 17 degrees incline are considered to be the major draws of the product. While the non-skid CoreTRAC ensures that the car does not slip, the 17-degree incline provides ample space underneath. Its robust design and 12000 lbs gross weight capacity let you manage small, sedan class and large vehicles with efficiency. The safety factor and simple design make car ramps an ideal choice for an oil change and other small maintenance jobs which can be done at home. These come in a variety of designs and functionalities to suit different types of cars and vehicles. But remember that there are no adjustment features available with products like car ramps. Hence it is always advisable to buy one that suits the make of your car. The recommendations made above can give you a fair idea about choosing the best one for your vehicle. Always make an informed choice depending upon the weight capacity, model and make. Our top picks in the category of car ramps are quite tough, firm and above all great value money. But once you make the purchase ensure that you familiarize yourself with the usage to avoid accidents.